It's been all change in our house recently - we undertook the (actually really complicated!) 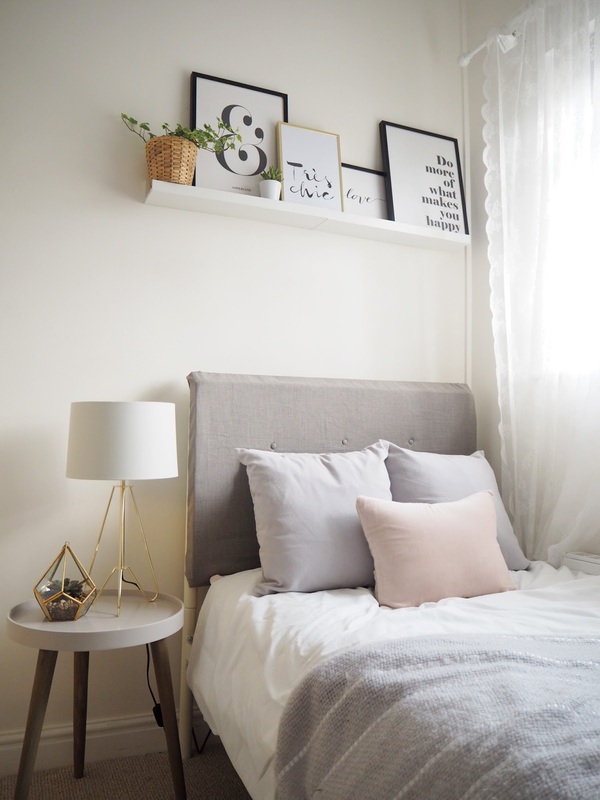 task of switching our two spare rooms over, giving the baby a larger room of her own and turning the tiny box room into a guest room. 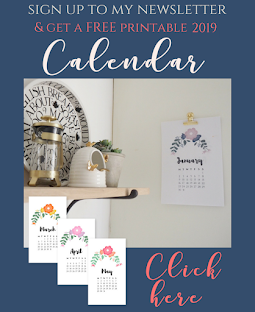 I've always struggled with this room, as you can probably tell by the fact its now had three different incarnations in the past year (see my sewing room makeover, and nursery makeovers). I think this was mainly due to the teeny size of the room, and the fact that its largely been used as a bit of a 'dumping ground' for all those bits and bobs you can't find a home for. However, following a brutal clear out, I'm now so happy with its finished state - a Scandi-inspired haven. 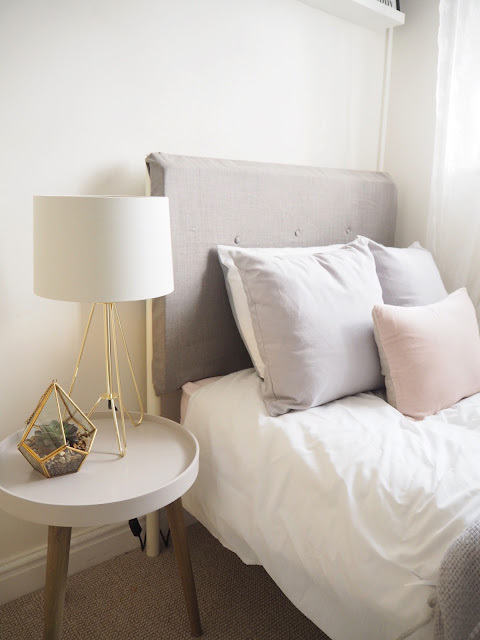 The guest room, in its previous incarnation, was very girly - all pink and floral, however after falling in love with all things Scandinavian, I decided to go for a much simpler look in here, and am so excited to reveal the final look to you here! I think its definitely a calmer, more serene space, that I hope my guests will love spending their visits to Dove Cottage in. The main feature of the room is my embroidered headboard. 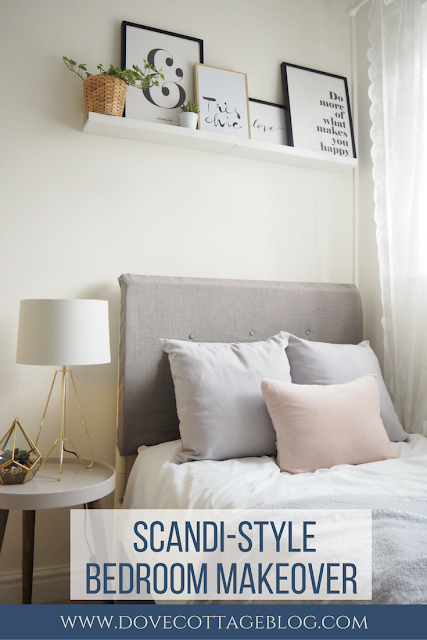 Financially, buying a new single bed for this room wasn't really an option, so I decided to give our current one a bit of a makeover, and made my own one for a fraction of the price - you can see exactly how I did it in my DIY post here. One of the other focus points is this absolutely beautiful side table from Cox & Cox, which I'm using as a bedside table. I always knew I definitely wanted one for in here, however due to the size of this room I knew a bulky unit with drawers wasn't going to work. I think this one goes perfectly in here though, and takes up very little space. I'm also in love with this Table Lamp from Wilko - don't you think it makes the perfect addition to a scandi-inspired room? 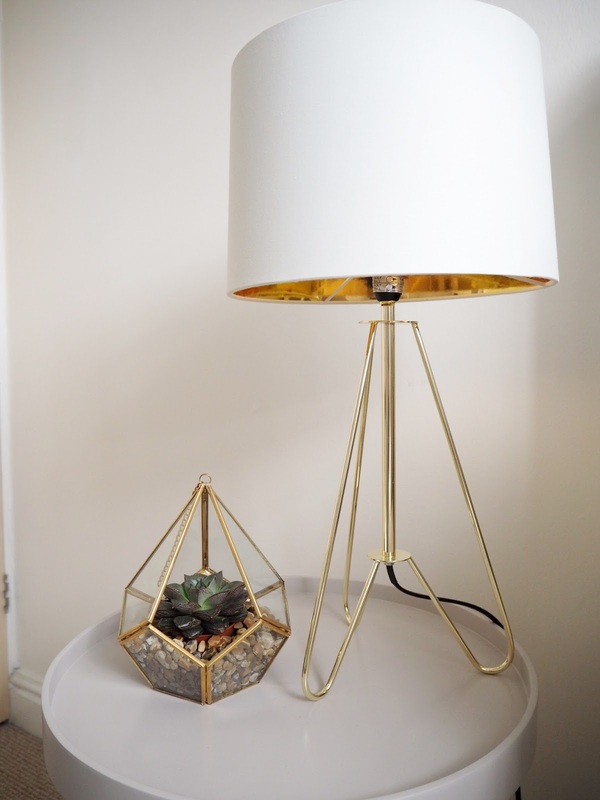 Its small base means it fits perfectly in this space, with large gold shade really creating a feature. I didn't want to 'overstyle' this area too much, as the Scandinavian look is all about simplicity - so I've also gone with this terrarium from Matalan, in which I've planted a succulent for here too. 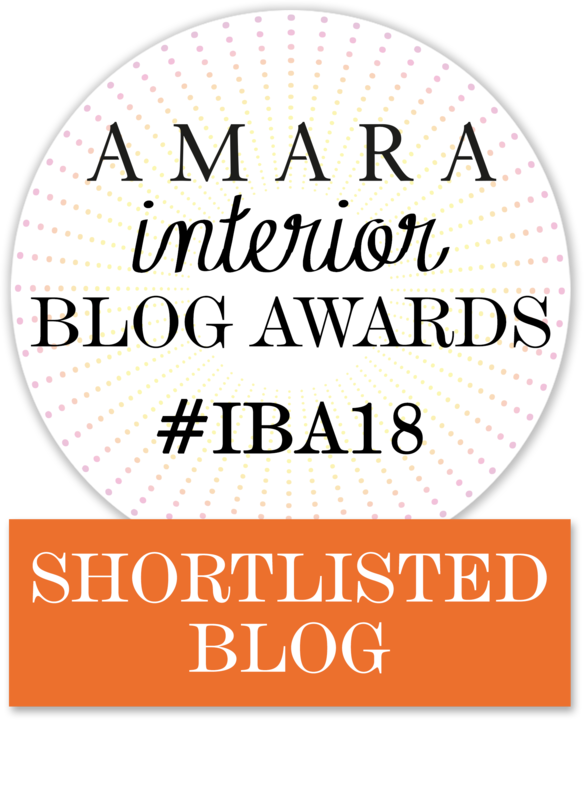 For the bed I've chosen some simple white bedding from George, adding colour and texture in through this beautiful Velvet & Linen cushion, also from Cox & Cox. 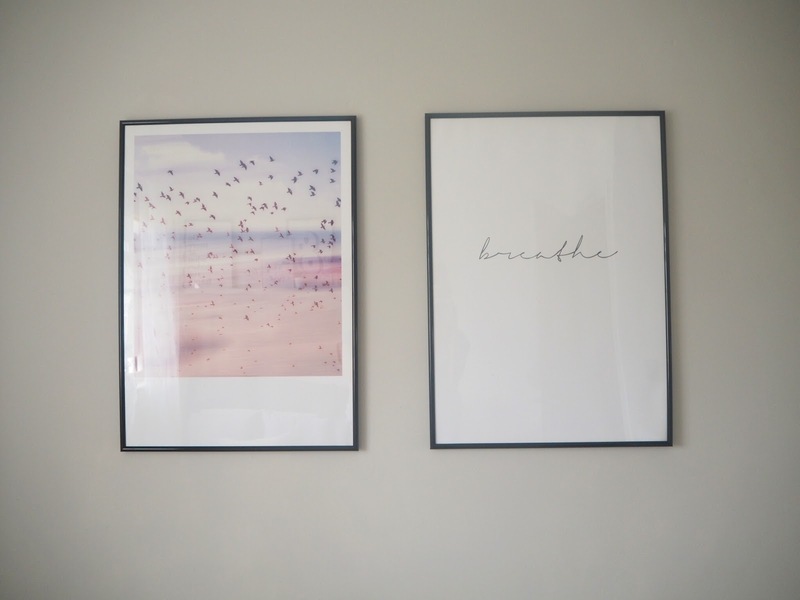 Seriously, its so soft and the blush pink is perfect for adding some colour to the grey and white. Above the bed I've styled some prints, and added another couple of house plants - to bring some nature to the room. The 'Tres Chic' print is from Chelsea Prints, all others are from Desenio. 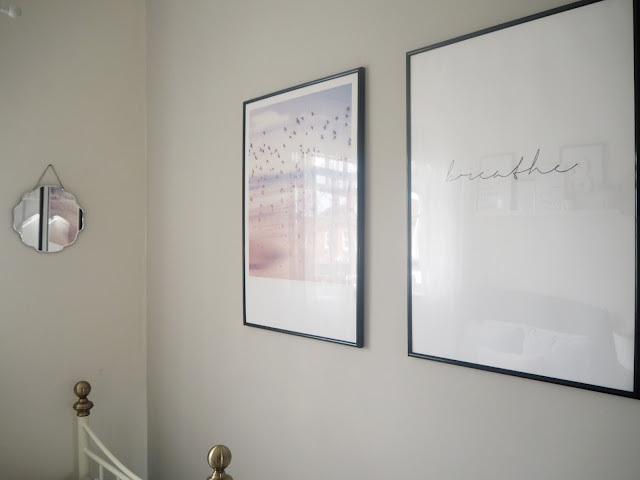 One of the walls in here is painted in Farrow & Balls Cornforth White, which makes a beautiful feature, and I've kept it really simple with some large prints, again from Desenio, which I think are a nice continuation of the calm feel. Finally, I've got my dressing table in here, which I've again kept really simple with just some of these beautiful Rustic Metallic Candles from Bolsius in gentle pink - which not only add a touch of glam with their ombre style, they also smell amazing! I'm so happy with this mini-makeover - I'd love to know what you think too!